BRISBANE – Wednesday March 20 @ The Tivoli. Tickets on sale here. Presented by Jet Black Cat Music. MELBOURNE – Thursday March 21 @ Melbourne Recital Centre. Tickets on sale here. SYDNEY – Friday March 22 @ The Enmore. Tickets on sale here. Mistletone very proudly presents Beach House‘s Australian tour 2019. BRISBANE: Tue February 26 @ The Tivoli * venue upgrade! all tickets purchased for The Triffid are valid. The Tivoli tickets here. PERTH: Thu February 28 @ Perth Festival. Tickets on sale here. SYDNEY: Mon March 4 @ Enmore Theatre. Tickets on sale here. ADELAIDE: Wed March 6 @ RCC Fringe, University of Adelaide. Tickets on sale here. MELBOURNE: Fri March 8 @ Forum Melbourne. Tickets on sale here. MEREDITH: Sat March 9 @ Golden Plains Festival. Tickets & info here. Saturday night, just on dark, GP Thirteen, as an expectant Sup’ swells in eucalyptic, festooned anticipation. Perfect Time and Place. And Space. Beach House have entered the pantheon of great dream pop acts. More recently, that dream has woken into epic soundscapes: cinematic, shoegazey, loud and dramatic. They’ve represented a high water mark for so many music-lovers for a long time now (77 songs to be exact) and recent albums, 7 and Depression Cherry, have lifted us higher still. Beach House (Victoria Legrand and Alex Scally, with drummer James Barone) bring their overwhelming, cinematic live show back to Australia next summer. Beach House released 7 (their 7th full-length record) on Mistletone (Australia) and Sub Pop (worldwide). They have been a band for over 13 years and have written and released a total of 77 songs together. Mail order 7 and other Beach House goodies here. The creation of 7 involved rebirth and rejuvenation; Scally and Legrand used to limit themselves to what they thought they could perform live, but this time that limitation was ignored. Unlike the last four albums, 7 didn’t have a producer in the traditional sense. Spacemen 3’s Sonic Boom (Peter Kember) became a significant force on this record by shedding conventions and helping to keep the songs alive and fresh. The band’s trusted live drummer from 2016 to the present, James Barone, played on the entire record, helping to keep rhythm at the centre of a lot of these songs. In the band’s own words, “we are interested by the human mind’s (and nature’s) tendency to create forces equal and opposite to those present. Thematically, this record often deals with the beauty that arises in dealing with darkness; the empathy and love that grows from collective trauma; the place one reaches when they accept rather than deny. The twisted double edge of glamour, with its perils and perfect moments, was an endless source. PERTH: Wednesday January 16 @ The Rosemount. Presented by Cool Perth Nights. Tickets on sale now. LAUNCESTON: Friday January 18 @ MONA FOMA. Tickets & info here. SYDNEY: Sunday January 20 @ Sydney Festival. Tickets & info here. MELBOURNE: Monday January 21 @ Melbourne Recital Centre with special guest Grand Salvo. Tickets & info here. BRISBANE: Tuesday January 22 @ The Tivoli. Tickets on sale now. Mistletone proudly presents the return of Julia Holter with her stunning ensemble, hot on the heels of her incredible new album, Aviary (out Friday October 26 on Domino). Aviary is an epic journey through what Los Angeles composer Julia Holter describes as “the cacophony of the mind in a melting world.” It’s her most breathtakingly expansive album yet, full of startling turns and dazzling instrumental arrangements. The follow-up to her critically acclaimed 2015 record, Have You in My Wilderness, it takes as its starting point a line from a 2009 short story by writer Etel Adnan: “I found myself in an aviary full of shrieking birds.” It’s a scenario that sounds straight out of a horror movie, but it’s also a pretty good metaphor for life in 2018, with its endless onslaught of political scandals, freakish natural disasters, and voices shouting their desires and resentments into the void. The first song to be shared from Aviary, ‘I Shall Love 2’ echoes that hope: “I am in love… There is nothing else“. “In a lot of the songs, when I mention love, it’s about a seeking for compassion and humility in a world where it feels like empathy is always being tested,” Holter says. In Aviary’s case, that search for sweetness – that bridging of the gulf – becomes a metaphor for the creative process itself, cutting through the hierarchies of history, language, and musical form to offer something more fluid, more inclusive, more idiosyncratic. MELBOURNE: January 31 @ The Croxton with The Goon Sax + Primo! Presented by Triple R. Presale from Wed 31 Oct 9am until Thu 1 Nov 8am, Tickets. General Public On Sale: from Thu 1 Nov 9am, Tickets. General Public On Sale: from Thu 1 Nov 9am, Tickets. Also playing LANEWAY FESTIVAL Auckland & Australia! Mistletone is rapt to present the return of Parquet Courts, with special guests The Goon Sax who recently released their new album We’re Not Talking. Melbourne’s Primo! will open in Melbourne. The tour comes hot on the heels of their Wide Awake remixes EP featuring two remixes by Mikey Young (Eddy Current, Total Control, etc) ‘Wide Awake (Club Mix)’ and ‘Normalization (Collective Witnessing Mix)’ and a ‘Wide Awake edit’ by legendary NYC DJ, Danny Krivit (listen / stream here). 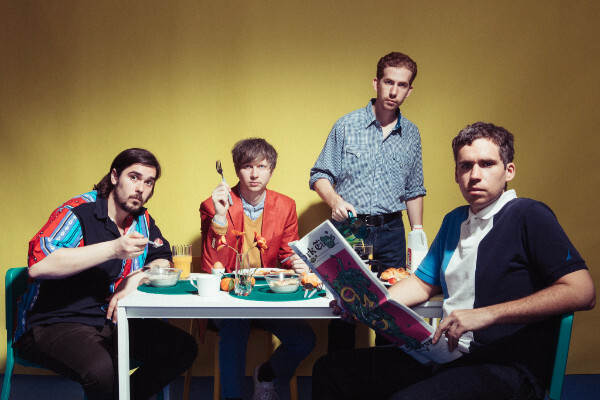 This will be Parquet Courts’ first visit to Australia off the back of their 2018 critically acclaimed album Wide Awake! (out now via Remote Control). The record is a groundbreaking work for the band, an album about independence and individuality but also about collectivity and communitarianism. There’s also a freshness here, a breaking of new territory that’s a testament to the group’s restless spirit. Part of this could be attributed to the fact that ‘Wide Awake!’ was produced by Brian Burton, better known as Danger Mouse.